In a 10 inch cast iron pan, over medium heat, melt the butter. Add the apple slices, 1 tablespoon of coconut sugar, a pinch of fine grain salt, a teaspoon of vanilla, and the ground cinnamon. Cook until apples are beginning to brown, about 4 minutes. 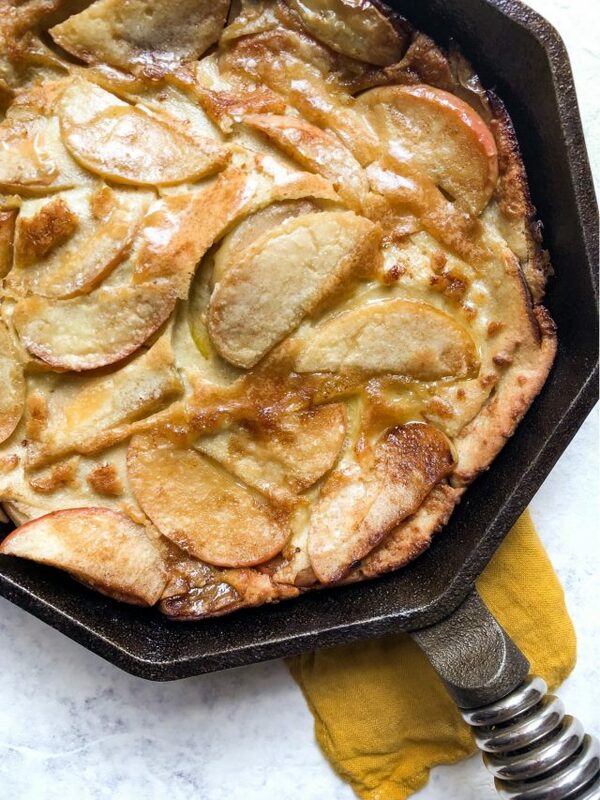 Use a wooden spoon to spread the apples in an even layer at the bottom of the pan and remove from heat. Blend the eggs, coconut milk, flour, 1 tablespoon of coconut sugar, 2 teaspoons of vanilla, and 1/4 teaspoon of salt until very smooth. Pour over apples and place the whole pan in the oven. Bake for 10 – 15 minutes, until the edges are brown but not burnt. Remove and serve immediately.